Hot springs is one of many attractions sought by travelers especially those coming from natural sources like volcanoes. When it comes to hot spring, you may think of Japan since there is hot spring called Onsen there which has been quite famous. However, it is not only Japan that has hot springs. Indonesia is one of the best countries if you are looking for amazing hot springs to enjoy during your trip. The hot springs in Indonesia are in fact worth travelling for. The best region to in Indonesia to find hot springs is West Java. When you visit Indonesia, there are many things to enjoy. When it comes to hot springs, there are many of them you can find especially in West Java. Hot springs are also thing that Indonesia people enjoy. This is a resort where you can find joy in every corner of it. There are bungalows, pools, and waterpark in this place you enjoy with your family. The pools are varied in size and depth. Thus, you can even bring your kids to enjoy especially since there is waterpark where you can let them having fun with the slides and giant bucket. Hot water here goes up to 45 degrees Celsius. This is located in Garut, West Java. This hot spring water park is one of the most visited destinations for families. Here you cannot only enjoy well-themed pool with hot water but also cottages rented for guests. Thus, you can enjoy natural spring water anytime you like. There is also large bird cage here where you can enjoy your relax time sipping your drinks while watching your kids playing in the water. If you like camping, there is camping ground where you can stargaze and build a fire camp. This resort is located in Bandung, West Java. This is originally one of the first establishments around Ciater spring. The resort is homey and there are ton on fun things served only for guests. Not only pool filled with hot spring water, there are also outbound games for you or your kids to try. Or, you can also opt for golf or horse riding. Or, you can try all of them, why not? This place is often packed during weekend so you’d better book in advance. This is located in Subang, West Java. This is a water theme park with hot spring water you can enjoy in any season. 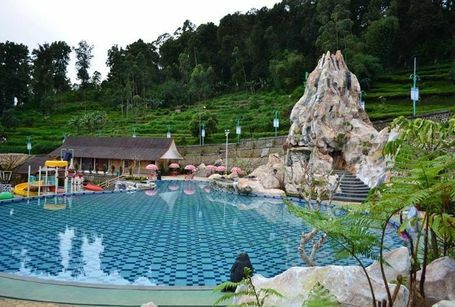 This is one of the most visited water park in Garut, West Java. There are slider booms in various height and length you can try to boost your adrenaline. There is also pool for you to enjoy fish therapy. You can soak your feet in the pool then the fish will gather around to collect all dead skin cells from them. The sensation is ticklish but you will enjoy it.